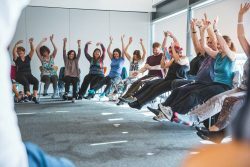 Laughter yoga overlaps with mindfulness. It also overlaps with embodiment. Movement and embodiment are natural partners. Together, they create a joy-filled combination for present-moment awareness. Laughter practices can bring our attention instantly into the ‘Now’. When we are laughing heartily, time shrinks or expands (take your pick), so that the only thing we are aware of is the present moment. Therefore when used in this way, laughter practices are an excellent route into mindful awareness. Movement and embodied awareness have the potential immediatly to end overthinking. When these are approached with inner awareness, and therefore the movement & sense of embodiment come from within, attention immediately moves away from our thoughts. Our attention doesn’t just move into our body but it also moves into the present moment. This is a different experience from merely being aware of our thoughts. Another insight from laughter (and other psychological) practices is the effect of the smile. It has been established many times how the effect of a smile lifts our mood. It is a natural stress-buster and mood-lifter. It is the sister to the William James observation ‘We don’t laugh because we’re happy, we’re happy because we laugh’. When we explore smiling practices, and in particular the feel of the inner smile, and combine this with embodiment and present-moment awareness, our ‘Now’ immediately feels different. Although the ‘Now’ is inherently joyful, when we add in smiling and laughter practices their combined effect enhances present-moment awareness surprisingly vividly. With practice, these three aspects support each other like a three-legged stool. One delightful aspect of this is that it doesn’t require an additional time commitment. We don’t have to sit for 20 minutes, three times a day, seven days a week, and learn a new practice. All we need to is become aware, and add smiling, laughter and embodiment practices into how we already live our life. Would you like the Move / Breathe / Smile video? This entry was posted in anxiety, Connection, Laughing Yogi, laughter yoga, mindfulness, resilience, smiling, stress management and tagged #laughteryogawithJoe, connection, happiness, laughter, laughter practices, mindfulness, resilience, smiling, stress management on March 18, 2019 by Joe Hoare. At times, we all have ‘It’ in our lives, that uncomfortable, troublesome, inconvenient piece of life that disrupts our calm or harmony. It usually involves emotion and therefore means feeling something we’d rather not – hence the uncomfortable, troublesome, inconvenient quality. It can appear as stress, anxiety, anger, and make us ill. It often makes us afraid. We’re often afraid because we know we’ve got to do something we’d rather not – face our fear, speak our truth, accept something about ourselves we wish wasn’t true. Face it. Feel it. Don’t flinch. Embrace it. ‘The cave you fear to enter holds the treasure you seek’ – Joseph Campbell. Every time I see someone do this, enter their cave and face their shadow, I see beautiful transformation occur. I see the shedding of a bit more ‘story’, a growth in authenticity, an inspiring vulnerability. I see people get stronger by owning their ‘weakness’. To do this, we need courage. It has to be more important to do this, to enter our cave, than to cower, flinch or run away – however enticing these false friends appear. How do we find our courage? We all have our own ways. My preparation includes the ancient insightful worldwide tradition of smiling. I put a genuine smile on my face, feel the inner warmth this generates, connect with my zest for life, and open myself to feeling whatever ‘It’ is. I feel it as deeply as possible. ‘It’ can be a wild ride, and having set off and started, ‘It’ might take you across some jagged unexpected inner terrain. Hang on. Hang in there. When you have a pause, take the time to breathe, smile and regroup. Smile and reach in for your stillness. Keep going till the ride is over. Always remember: the purpose of ‘It’ is to bring about self-healing, an increase in kindness, compassion, authenticity and connection. Also remember: it’s a never-ending journey. Smiling helps. That’s why it’s such an ancient recommendation. This entry was posted in anxiety, Connection, happiness, Laughing Yogi, laughter yoga and tagged anxiety, connection, depression, happiness, laughter yoga, mindfulness, nls: natural laughter skills, positive psychology, smiling, stress management, vulnerability, wellbeing on July 13, 2015 by Joe Hoare. Laughter meditation and mindfulness are natural companions. Mindfulness is the practice of awareness. It is the act of noticing your body, breath, emotions, thoughts and environment, without necessarily responding to any of them. People usually find this practice calming. Because of this calm, they often experience quiet joyfulness. This quiet joyfulness often brings a smile to their face. Laughter meditation, whether through laughter yoga or nls: natural laughter skills, stimulates mindfulness. It brings attention into the here & now. People find they become more present and more aware of their own processes and environment. This happens in a naturally joyful way. The act of laughter meditation therefore can stimulate joyful awareness. The easiest way to combine these practices is through by smiling practices. These smiling practices, as described in ‘Awakening the Laughing Buddha within’, can add the specific quality of joyfulness into mindfulness. As a meditative practice, this is like the difference between a ‘zazen’ or observing meditation and a dynamic one. When you next do either a laughter yoga or nls: natural laughter skills meditation, make a point of being aware of your body, breath, emotions, thoughts and environment. The practice is to combine your laughter with your awareness so you are aware of both. When you next do your mindfulness meditation, do it with a soft, small, genuine smile on your face. Notice any difference this smiling quality brings to your awareness. Be open to expressing it as occasional chuckles or laughs of delight. This is gentle laughing mindfulness. Notice how it can lift your mood, ease stress, anxiety and depression, give you a psychological boost, and promote a sense of wellbeing and happiness. If you practice this often, you will rewire your brain for greater happiness and an improved quality of life. 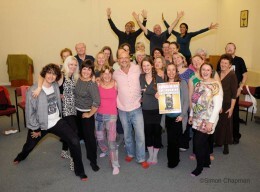 You can learn more about these practices in ‘Awakening the Laughing Buddha within’ and on www.joehoare.co.uk. This entry was posted in Action for Happiness, anxiety, depression, happiness, Laughing Buddha, laughter, laughter therapy, laughter yoga, meditation, mindfulness, nls: natural laughter skills, smiling, stress, stress management and tagged anxiety, depression, happiness, Laughing Buddha, laughter, laughter meditation, laughter the best medicine, laughter therapy, laughter yoga, mindfulness, nls: natural laughter skills, positive psychology, smiling, stress, stress management, wellbeing on July 24, 2014 by Joe Hoare. 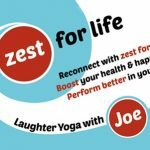 Can laughter yoga make me more confident? sessions at the Bristol Laughter Club. The most common answer is ‘I feel better’. When I then ask how people experience that, their responses include feeling more relaxed, grounded, intuitive and focused. When they continue this deeper reflection, people realise they’re more mindful, relaxed and happier, more aware of the totality of present moment rather than just what’s passing through their head. ‘Don’t believe everything you think’ say both the philosopher Alan Watts and the contemporary mindfulness & awareness guru Eckhart Tolle. The upshot of this mindfulness is we feel happier and better about our own life experience, and a common way people express this is they feel more confident. This is an especially wonderful benefit for those who suffer from the modern epidemics of stress, anxiety and depression. 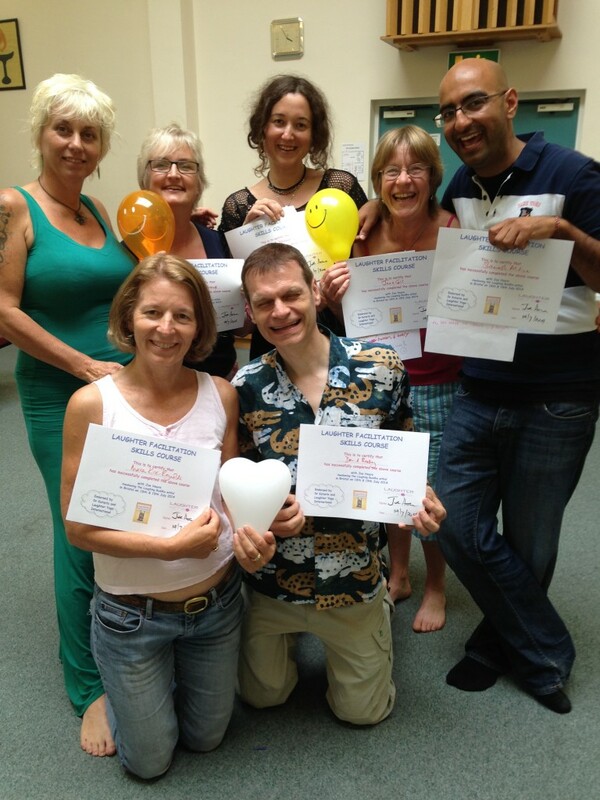 A recent participant on a nls: natural laughter skills course is a life model, i.e. she poses naked for artists to draw her. She now sits with greater confidence, and feels more confident about dealing with tricky clients. The particular exercises that help her in these circumstances are the ‘Inner Smile’ and the ‘Inner Laugh’, covered in depth courses and described at length in ‘Awakening the Laughing Buddha within’. Developing the ability to do either or both of these on demand gives her the ability to change her mood in an instant. Because this is empowering, she has gained enormous confidence in her work and day-to-day life. The ‘Inner Smile’ is a quintessentially mindful exercise and at heart invites you to take your attention inside and smile, internally. There are many refinements but this is the exercise in its simplest form. It is easy, non-obtrusive, and you can do it anywhere. you can even practice it now. These exercises also sit naturally alongside other disciplines like Positive Psychology, CBT and yoga. If you practice your ‘Inner Smile’ and ‘Inner Laugh’ regularly, you become more mindful, less stressed, anxious and depressed. The benefits you experience include relaxation, being grounded, focus, the ability to prioritise your time and efforts, increased happiness, and greater confidence. What can these practices do for you? This entry was posted in anxiety, depression, happiness, Laughing Yogi, laughter, laughter therapy, laughter yoga, mindfulness, nls: natural laughter skills, psychology, smiling, stress, stress management and tagged anxiety, connection, depression, endorphins, happiness, laughter, laughter meditation, laughter the best medicine, laughter therapy, laughter yoga, mindfulness, nls: natural laughter skills, positive psychology, smiling, stress, stress management, time management, wellbeing on July 14, 2014 by Joe Hoare. Time: your ally or your enemy? ‘The busier I get, the more I meditate’, says the Dalai Lama. The most important aspect for all busy, stressed, anxious people to remember is to use time well, to deal with priorities, and to avoid mistakes and duplication. The biggest mistake is to feel too busy to re-prioritise and re-assess current needs. – take at least 30 seconds in this routine. When you do this, you re-assert a measure of control into your life and therefore into your time management. If you are alert to your inner processes, you might experience a settling, like a Christmas snow scene which has all the snow swirling and shaken up, and when allowed to stand, it all settles again. You might experience the ‘noise’ of life quietening down, and the important ‘signals’ becoming more audible. However you experience it, the act of deliberately inserting a break is an empowering action, gives you a greater sense of control, relieves stress, anxiety and pressure, and allows priorities to clarify. You come out of this break with a better sense of what to do next, and how to do it. Specifically, this process allows you to identify your top priorities and the appropriate actions to achieve them. 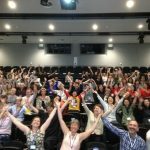 Awareness and ‘now’ practices like laughter yoga, nls: natural laughter skills, meditation and mindfulness, especially when used regularly, help you identify when you need these breaks. The earlier you spot the need and take action, the better your time management. Consequently, you start to experience lower your stress levels, less anxiety, greater happiness & general wellbeing, and increased productivity. Whatever else, you feel better because you feel more in control. When you feel better, you can be more focused. When you feel better and more focused, your time can become fun – and those who have fun get more done. 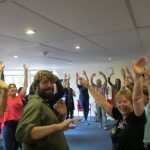 This entry was posted in Action for Happiness, anxiety, happiness, laughter yoga, meditation, mindfulness, nls: natural laughter skills, psychology, stress management and tagged anxiety, Dalai Lama, happiness, laughter, laughter meditation, laughter yoga, leadership, mindfulness, nls: natural laughter skills, positive psychology, smiling, stress management, time management, wellbeing on June 12, 2014 by Joe Hoare. ‘What’s the point? Why would I do this?’ I was asked recently. These questions take us to the heart of the healing power of laughter. Why is it such a good stress-buster? Does it ease anxiety and depression? Does it improve health, wellbeing and happiness? Basically, does ‘laughter the best medicine’ deserve its reputation? The short answer of course is ‘Yes’. The long answer is also ‘Yes’. But why is this so? When I ask people how they feel when they laugh, the most frequent comment is ‘I feel better’. What does this mean to you? If you stop, breathe, smile and explore ‘feeling better’, what do you experience? Do you get a sense of an upward curve, of life improving? I specifically invite you to stop, breathe, smile, relax right now, and simply feel what you’re feeling, whatever that is. Take a moment to feel the experience of your life before reading any further, and then add the phrase ‘I feel better’ into your experience. Do you notice a difference? The longer I use nls: natural laughter skills, laughter yoga and laughter therapy, the more I appreciate the Dalai Lama (‘Be optimistic. It feels better‘) and contemporary psychological insight that ‘I feel better’ is significant and underappreciated. We feel more in control, and we enjoy life more. We beat back stress because we become more resilient, generous and open-hearted. We improve our mood because we are having a better experience of being alive. We feel more cheerful and optimistic because we ease anxiety, loneliness and depression. We improve our relationships because we are a warmer, more approachable human being. We become someone people instinctively warm to and want to communicate with. Aren’t these good enough reasons to ‘wake up laughing’? The fact there are important, numerous and well-documented benefits for conditions like diabetes, cardiovascular health, depression, weight loss and many others is an added supportive factor. Physiologically and psychologically, these are highly significant, and they also combine well with disciplines like yoga, meditation, laughter meditation, positive psychology, as well as mindfulness practices. However, the improvement in spiritual, psychological and overall wellbeing is perhaps the most fundamental benefit. This is another way of saying we become happier, and is why organisations like Action for Happiness support these activities. Excitingly and interestingly, even a short exposure to nls: natural laughter skills and laughter yoga can activate this. One person came up to me at a healing arts festival and told me she’d taken part in one of my 15 minute sessions the previous year. She told me she had then spent a difficult and relentlessly demanding year as carer for a family member. She found that as a result of her 15-minute experience she felt so buoyed up that this kept her going all year. All the other health benefits are important but to me sometimes they pale besides the improved life experience that these 15 minutes contributed to this person. I leave you with this quote from Ralph Waldo Emerson (1803 – 1882), and I encourage you to ‘wake up laughing’. This entry was posted in Action for Happiness, anxiety, Connection, depression, happiness, Laughing Yogi, laughter, laughter therapy, laughter yoga, meditation, mindfulness, nls: natural laughter skills, psychology, smiling, stress, stress management and tagged anxiety, connection, Dalai Lama, depression, endorphins, happiness, Laughing Buddha, laughter, laughter meditation, laughter the best medicine, laughter therapy, laughter yoga, mindfulness, nls: natural laughter skills, positive psychology, spirituality, stress, stress management, wellbeing on May 29, 2014 by Joe Hoare. There are two short answers. The first is: don’t. If you don’t want to force even a smile, don’t. There’s no reason you have to smile. Whatever we do is a choice, conscious or not, and every choice is wonderful. Every choice is an experience, and every experience is valid and useful. So if you don’t feel like smiling because it’s too hard, don’t. The second answer is that if you want to force a smile: do. The short answer to any question on how to do something is always: by doing it. However, as we peel away the layers of stress, anxiety and depression, we come to realise the question is how to motivate ourselves to do something we sense/feel/know will help us, even when we don’t really feel like doing it. This is a common occurrence for all of us but especially for people with extreme conditions like cancer and MS. Once we realise it’s a motivation question, that is, how to help us do something we know is going to help us, solutions start to present themselves and we start to relieve our stress and ease anxiety & depression. One clue is that the question has even been asked. This indicates mindfulness and awareness. In my coaching practice, mindfulness and awareness are essential (and easily developed) because they underpin a willingness on the part of the asker to change their life experience from an often stressed or anxious state to something more positive and upbeat. As soon as there is willingness, there is a measure of space and separation around the situation, and this space allows the possibility of conscious choice, and a lifting of stress and anxiety. 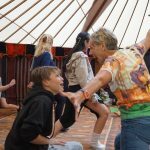 Fuelled by this willingness, and using insights from nls: natural laughter skills, laughter yoga and positive psychology among others, there are two simple paths. One is experiential, and the other uses the power of our mind. Practicing either of these, we can all learn to lift our spirits by smiling more. When we have reached the point where even though it’s too hard to force even a smile, we’ve decided we’re going to, if you’re an experiential person, just smile. Recently I was with a group of elderly people who suffer from macular degeneration (sight loss), and one of them said chirpily that when she starts to get ‘down’ she just smiles. She is naturally experiential and has discovered her own, and now widely used, antidote for low spirits and depression. For others, it’s easier to use the power of the mind and in their mind’s eye either to remember something that generates a smile, or anticipate something. Both routes are wonderful, and both work well because they’re based on a positive choice you’ve made. They are empowering. If you find you can’t bring yourself to do either of these but want to do something, hold a pencil in your teeth, or even your finger. Hold it across your mouth without it touching your lips. This facial position is the facial position of a smile, and simply having your face in this position tricks your brain into releasing mood-enhancing endorphins as if you’re smiling a genuine smile. There is a business coach I know who uses this technique when she’s driving between clients, to help her arrive in her most upbeat, positive mood possible. There are of course many other ways we can change our mood, including exercise, yoga and meditation, but the beauty of the approach described above is that you don’t need any props, external stimuli or other activity. Because of their simple effectiveness, these smiling exercises are the starting point in the book ‘Awakening the Laughing Buddha within’. People’s testimonials in the book speak for themselves. Even if you’re stuck in a hospital bed or on a desert island, plagued by anxiety, worry or depression, with no access to friends, phones, TV or any other media, you can still force a smile this way, once you’re ready to. This entry was posted in Action for Happiness, anxiety, cancer, depression, happiness, Laughing Buddha, Laughing Yogi, laughter, laughter therapy, laughter yoga, meditation, mindfulness, nls: natural laughter skills, smiling, stress, stress management and tagged anxiety, cancer, connection, depression, endorphins, happiness, laughter, laughter meditation, laughter the best medicine, laughter therapy, laughter yoga, mindfulness, nls: natural laughter skills, positive psychology, psycho-neuro-immunology, smiling, stress, stress management on April 30, 2014 by Joe Hoare.